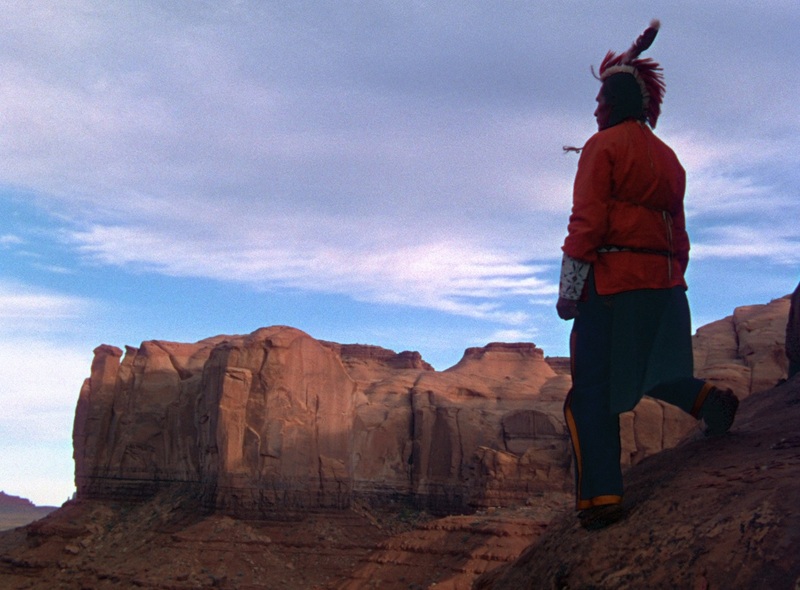 Many tribes have traveled great distances to band together for war. Fort Starke makes for a hell of a target. Under different circumstances, perhaps Captain Nathan Brittles (John Wayne) would have had to lead the cavalrymen under his command into a hellish, prolonged battle against these warriors. That's not in the cards, however, as only six days remain until the aging captain is being forced to retire. A few days would be more than enough time for Brittles, under protest, and his men to shepherd his commander's wife (Mildred Natwick) and niece (Joanne Dru) to the safety of a stagecoach post. Through perseverance and careful observations of the threats that lay ahead, the U.S. Cavalry does indeed safely get these two women to the post. If only the same could be said about the post itself, as it has already been razed to the ground by Indian warriors. After returning to Fort Starke, the impossibility of this situation weighs heavily on Brittles. He could defy the Cavalry, lead into battle these many men who admire and respect him, and square off against the united tribal forces for however many months it takes. 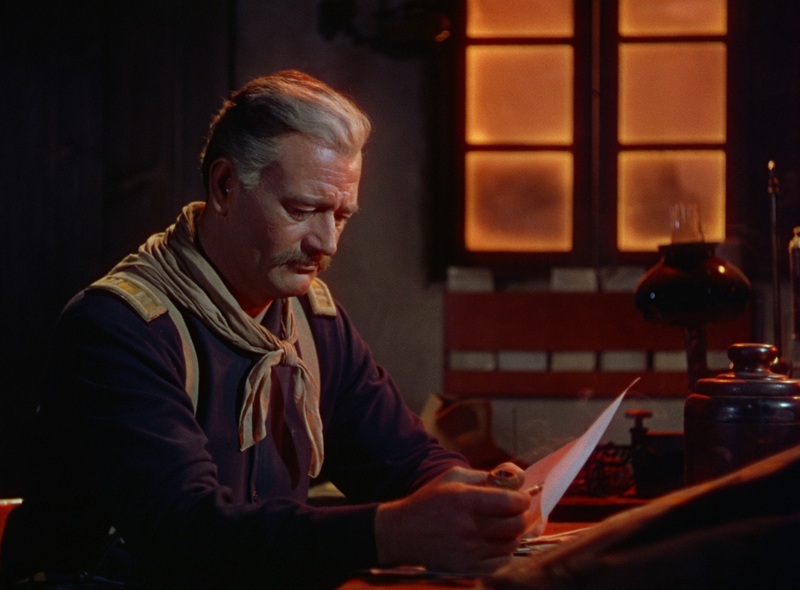 Major Allshard (George O'Brien) reminds the captain that the reason Brittles is the leader he is today is because more seasoned, experienced men stepped aside so he'd have the opportunity to be tested in battle. If Brittles were to gallop into the battlefield, he would even through victory be doing his men a disservice. Brittles agrees to respect the Cavalry's decision to put him out to pasture, but a few hours remain of his command, and he's determined to make the most of every last second. 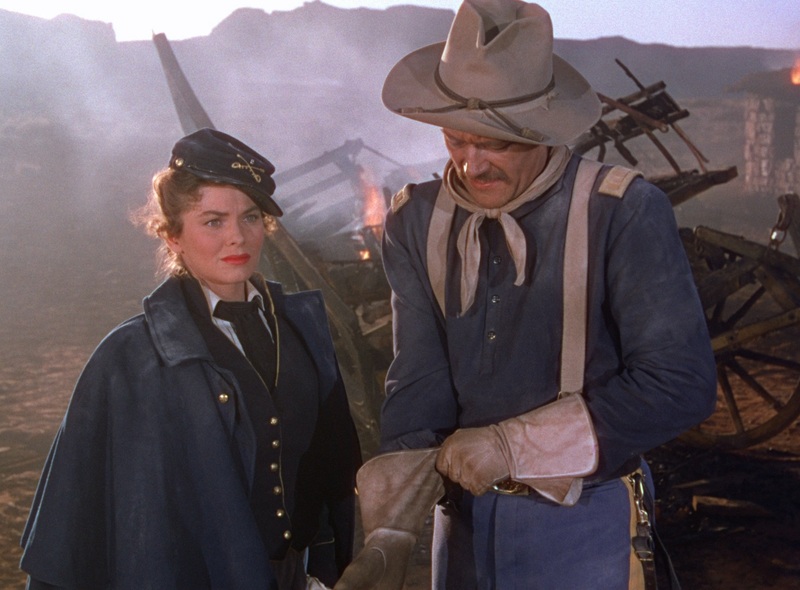 In contrast to the imagery and emotions its title may evoke, She Wore a Yellow Ribbon is largely John Ford defining what it is to be a man. It's not about chest-thumping, nor does Ford necessarily even glorify victory in the battlefield. It's about camaraderie, respect, responsibility, and duty. Brittles bristles at the idea of babysitting Allshard's family in such dangerous circumstances, but he does what must be done, and the major even helps him write a formal letter of protest. Real men don't return to a life of ease and privilege with their well-to-do families; they're steeled into something far more substantial in the military. Soldiers on a mission don't bicker with one another over a woman, no matter how lovely she may be. Young warriors on both sides may be eager to march into battle, but with age and wisdom come the maturity to look at war as a threat that should be avoided whenever possible. Ford has no interest in crafting a film that climaxes on a battlefield littered with bloodied corpses. There are neither heroes nor villains in the traditional sense. The united tribes are in no way demonized, and the elders on both sides of the conflict know, respect, and are even friends with one another. Ford presents a powderkeg, and the way he resolves this volatile situation is thrilling yet in many ways defies expectations. 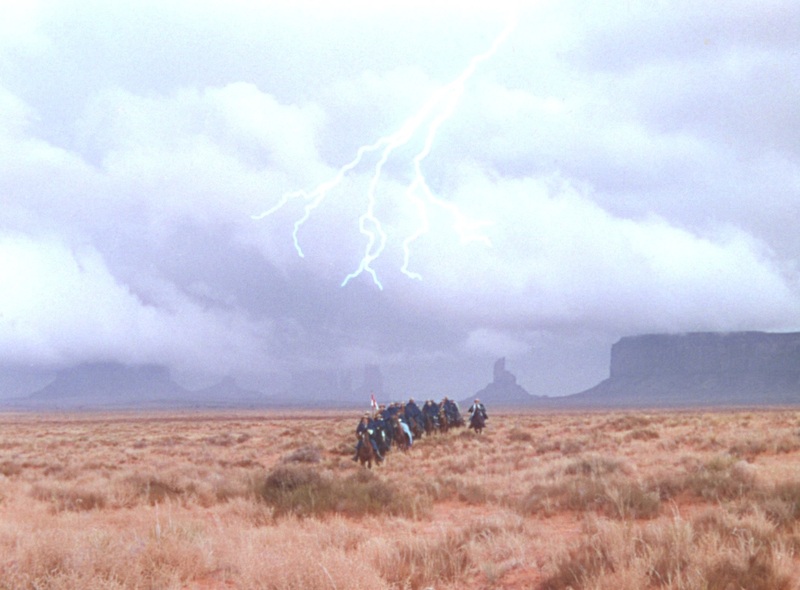 It also makes for a terrific companion piece to Fort Apache -- the previous installment in Ford's Cavalry trilogy -- which culminates in an equally daring charge with profoundly different results. The story goes that John Ford had no intention of casting John Wayne as Captain Brittles, a character some twenty years Wayne's senior. Ford was so impressed by Wayne in Howard Hawks' Red River that he reconsidered, and I can't imagine She Wore a Yellow Ribbon with anyone else in the lead. Wayne escapes brilliantly into this sexagenarian captain: a man who immediately inspires admiration and respect but has seemingly little purpose outside of the Cavalry. His beloved wife has passed. He has no family or prospects, planning to head to California after retirement because...well, it seems like the thing to do. That turmoil and uncertainty are deeply felt. Ford, his talented cast of familiar faces, and screenwriters Laurence Stallings and Frank Nugent deftly blend together a number of potentially disparate elements: the looming threat of a massacre, the angst of obsolescence, a bit of a love triangle, the warm camaraderie among the cavalrymen, a steady undercurrent of duty and responsibility, and a playful sense of humor. This would almost certainly have resulted in tonal whiplash in lesser hands, but Ford and his company ensure that these many facets of She Wore a Yellow Ribbon are instead skillfully, seamlessly woven together. She Wore a Yellow Ribbon is in every way marvelous. The Academy Award cinematography is beautiful beyond description. This is a film whose most memorable moments are not sweeping, epic battles but smaller and more character-driven. It's comfortable palling around with these characters rather than breathlessly rushing from one setpiece to the next, and the movie is far better for it. 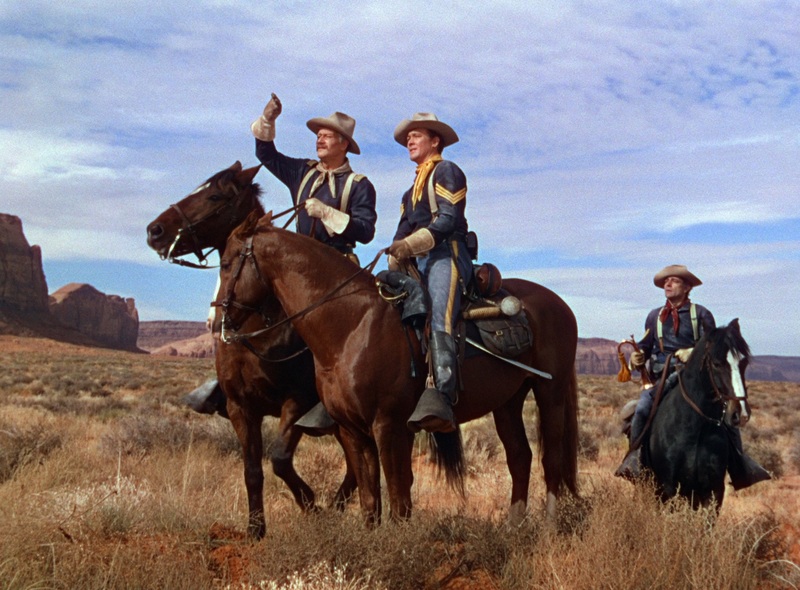 This is far and away my favorite of Ford's Cavalry trilogy, and though four years have passed since Fort Apache and Rio Grande first arrived on Blu-ray, Warner Archive has more than made She Wore a Yellow Ribbon worth the wait. Very Highly Recommended. 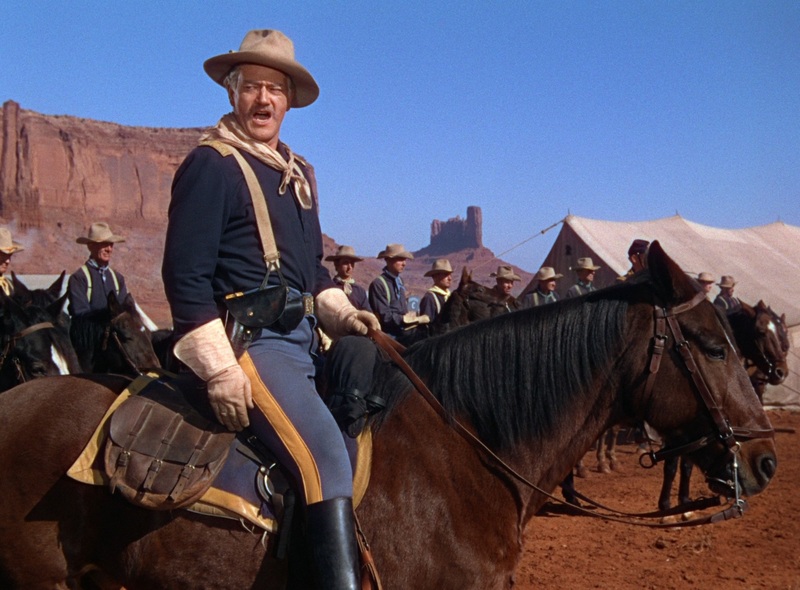 Only one of the films in John Ford's storied Cavalry Trilogy was produced in color, and it stands to reason that it'd be She Wore a Yellow Ribbon. Winton Hoch's cinematography earned him his second consecutive Academy Award, and these visuals would be achingly gorgeous regardless of the medium. In high definition, though, She Wore a Yellow Ribbon leaves me awestruck. I mean that in the most literal sense; I repeatedly found myself so entranced by the masterful framing, its breathtaking Technicolor palette, and the staggering levels of definition and detail on display that I'd realize I needed to focus to give the dialogue its proper due. This Blu-ray release by Warner Archive is, simply put, perfect. Its distinctively Technicolor hues have been newly restored to their rich and vibrant glory. Beyond the titular ribbon, the color photography serves a compelling narrative purpose, with the ever-changing sky conveying the passage of time and how few days remain of Captain Brittles' command. The expansive vistas shine on Blu-ray, to the point that each cavalryman, warrior, buffalo, horse at full gallop, and even individual blades of desert grass are clearly and distinctly rendered. There is nary a nick nor a fleck of dust to be found anywhere throughout the film's 104 minute runtime. The authoring of this disc is as masterful as the restoration itself, ensuring that every last frame appears natural and filmic. While other labels would be tempted to squeeze She Wore a Yellow Ribbon onto a single layer to keep costs down, Warner Archive allows this high-bitrate AVC encode to spread across both layers of a BD-50 disc. As with all of Warner Archive's Blu-ray releases, this is a properly pressed disc, not to be mistaken for a manufactured-on-demand release. This presentation of She Wore a Yellow Ribbon is exceptional in every way conceivable, remarkable even among Warner Archive's already stunning 2016 release slate. This 24-bit, two-channel monaural lossless soundtrack isn't the revelation that the visual presentation is, but this DTS-HD Master Audio track leaves very little room for disappointment just the same. The overall quality and fidelity are comparable to Fort Apache, if you'd like a point of reference in the same trilogy. The score by longtime Ford collaborator Richard Hageman is reproduced well, and although the film's dialogue doesn't belie its age, it's readily discerned and entirely pleasant to listen to from start to finish. There are no flaws or artifacts of any concern. As expected, this is a job well done. A pair of Dolby Digital soundtracks (192kbps) present She Wore a Yellow Ribbon in French and Spanish. Subtitles are offered in English (SDH), French, and Spanish (Latino and Castilian). The extras are the same as the 2002 DVD release. Trailer (3 min. ; HD): It's wonderful to see that the two and a half minute theatrical trailer for She Wore a Yellow Ribbon has been remastered in high definition as well. John Ford Home Movies (4 min. ; SD): This reel of 16mm footage from some unspecified point in the 1940s documents Ford joined by John Wayne as they scout for locations near Mazatlán, Mexico. 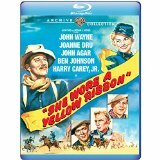 Warner Archive's already astonishing release slate this year grows that much more impressive with the addition of She Wore a Yellow Ribbon. This is perhaps the most gorgeous Western ever filmed, boasts one of John Wayne's greatest performances, and is to my mind the best of John Ford's Cavalry Trilogy. Very, very Highly Recommended.